Hey guys I made a game! By going through stress. Just type "Slime Attack!" in the search bar you'll get it. It's a little bad but it's made an 11 year old. Which is Michael. Which is also me. Have you ever needed to be absolutely perfect? In Perfection, now you have a chance to! This game is dope. I'm super amped to see the outcomes of the other walkthroughs! Maybe eventually see a part 2? The game was great. It had very interesting elements and, kept the suspense going all the way thru. I was shocked about how accurate the data log was at the end based on my actions! Hope you develop more games like this in the future! Hey everyone Check this weird stuff out! Hi, just wanted to leave my thoughts about the game, from the things i liked and things l didn’t or glitches i found (apologize in advance,English is my secondary language).To start off, the introduction “information commercial” was funny, cute, and set up the intro nicely. Secondly, i liked that as we enter the game were introduced with 3 different cards. which i assume will then provide 3 different experiences. Based on the card the player chooses at the start of the game has an impact on the environment later, thus giving it replay value. i always appreciate a Dev that pays attention to detail, from little knick knacks on the table to the decoration around the room they set up, i feel it shows they took time and effort on the project. The quality of the game looks decent, didn’t experience any hiccups, it ran smoothly on my crappy PC hah. The topic of the game was interesting, “perfection” i don’t have much on the topic, other than that word is scary to me now, yo. i did experience a glitch in my first run on the game, when i left the room where i picked up the “perfection helmet” the head gear thing, right after i left that room my character got kicked out outta the building and started walking outside the building, lol. maybe it just me but i felt the game lacked (correct me if i'm using the word wrong lol) i felt like it could use like a more dark ominous sound in the background to create a dark "ambiance" like the audio speed slowing down, i feel if there was more stuff like that it be more spoopy. i didn’t really experience much problems apart from the outta map glitch. i had fun playing the game. good job on the project, keep up the good work!. i did a play-through for the game, adios! Thank you so much for this detailed feedback, I really appreciate it and will be looking into that bug, sounds quite funny! I'm so glad to hear that you appreciated the effort we put into making the environment 'lived in' as well with all of the small knick knacks :) Thanks playing and the let's play also! It was fun, short but fun, I would like to see more hashed out from it if possible and see what you come up with. I love the idea and I would love to see more personalized horror games! This game is a mind bender for sure! Mix in some creepy horror vibes and this is one heck of a ride! Check it out! Worth your time for sure! J'ai adoré ce voyage et la morale est juste (parfaite)! Merci pour ce jeu je conseille à tous!!!!!! Really interesting game concept! Really cool to see the information at the end and being able to make choices for myself. Also a really creepy monster..
Have you ever wanted to be absolutely perfect? In Perfection, now you have a chance to! Just wanted to say thank you for this experience, it's nice to see horror that falls more on psychological and unique experience. Very impressed. Cool game I gave it a try and don't mind the thumbnail just having fun with it lol. It's an interesting idea, having the game attempt to adapt to your choices. I wish there was a bit more choices at the beginning and more things to interact with. Really neat game. It's pretty cool that the game tries to adapt from your choices. Hi there, I just played through the game and wanted to share some of my thoughts on it here. I'll just be quickly going through some of the things I liked, maybe a few things I didn't like and any bugs I might have stumbled across. I'll start with the things I liked or enjoyed about the game. I liked the 'infomercial' video in the beginning, it sets the game up nicely and adds a bit of humour to the game early on. 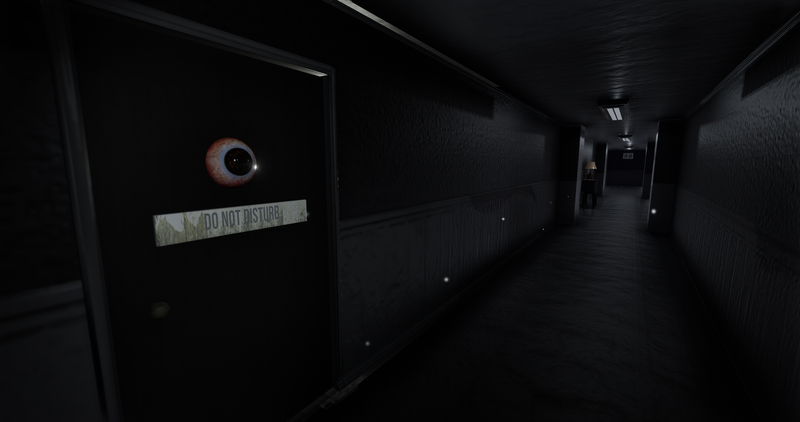 I liked that the image the player chooses at the start of the game has an impact on the environment later on, like if they choose the eye-ball picture then the paintings/pictures later on are of eye-balls, this also adds to how the game tries to adapt to the players actions, depending on what the player interacts with or doesn't, affects the 'psychiatric report' at the end, it's a very nice touch overall. The game definitely gets points for having a weird and unnerving atmosphere. I also liked how the game tackles a very important subject in modern society, the pursuit of perfection, and how people tend to over analyze themselves to the point where every little imperfection eats away at them to the point where they despise themselves. Now I'll just go over some of the things I didn't quite like about the game. First off, the performance isn't quite up to snuff, I could feel my mouse movements becoming sluggish at times, which is usually a sign of a low frame rate or poor frame times, and given that the game isn't graphically impressive this shouldn't have been an issue. For added information I was playing at 2560x1440 with a GTX 1080. As mentioned, I didn't find the game graphically impressive in the slightest, that obviously doesn't make it a bad game, but it doesn't help. I'm happy to say that I didn't encounter any game breaking bugs throughout my playthrough. Overall the game is quite interesting, it's incredibly weird but that's part of its charm. I really enjoyed how the game tried to adapt to my choices and how I interacted with the environment. It has some decent scares to it, and a pretty unnerving atmosphere. I believe that it sums up a persons struggle with the pursuit of perfection perfectly. I would consider the performance issues I faced to be a very minor issue, but it did hinder my experience a smidge. Overall an enjoyable, albeit weird, experience. I hope you don't mind but I made a let's play of my time with the game over on my channel. The concept of gathering data, while the player progresses through the game is a brilliant idea! You handled the way the events affect the final assessment really well. Almost every interaction with objects/characters made a difference. The profiles might be limited, but they work well! The intro was something I wasn't expecting and it turned out to be a pleasant surprise. I enjoy FMVs in modern games, when they are well done like yours. Visually the game is okay with some really weird stuttering/tearing issues in the beggining area. Also there is a clipping bug, where every object dissapears and the only visible thing is the HDR image. Other than these minor issues it is great. The audio is also well done! The cues are setting up the mood perfectly and seamlessly. Generally, I had lots of fun playing your game!! The whole profile thing is clever and working good. I hope we see more of this game! I really enjoyed your game! thank you so much for sharing it! I wonder what results other people will get? I had a suggestion at the end of my video if you want to check it out, otherwise, thank you so much for sharing you art! Everything I've seen about this game seems lovely, and the opening video is well made. Unfortunately the game crashes for me right afterwards, though the music keeps playing and on one instance it was using 85% of my cpu? So there seems to be some bug issues to work out yet, understandable for only having been out for 3 days, but I hope a fix is found soon as I'd very much like to have this experience myself. While I don't know all of my specs, I am running on a fairly new (<2 years old) laptop computer with widows 10 and an external hard drive (3tb). Somewhat rough around the edges and I don't know if I completely agree with my particular assessment, but I had a lot of fun with this. Loved the intro. Adding the behind the scenes development process stuff is a nice touch too.